a new seed company in the finger lakes! we love seeing new companies pop up. Fruition Seeds! Check out their Kickstarter, Blog and Facebook page. 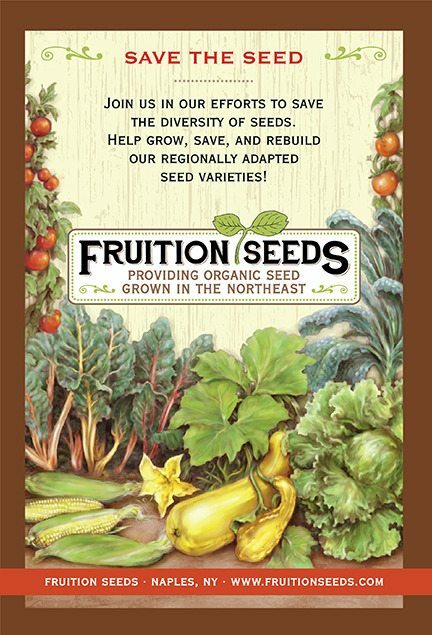 Fruition Seeds grows three acres of certified organic seed in the Finger Lakes of New York and collaborates with several other regional certified growers to offer outstanding organic vegetable, herb, flower and grain seed in the Northeast. A life-long seed saver, story collector and adventurer native to the Finger Lakes, Petra Page-Mann loves all things Small and Unassuming. For the last decade she’s travelled the globe, soaking in the wisdom of small scale, ecological agriculture and is glad to be home in the hills, beginning a seed company called Fruition with her partner Matthew Goldfarb.